Business is good but the balance sheet is not. Over time, the business’s equity has gone from positive to negative—it owes money to lots of people. How did it happen? Could be a big hit on a job. Might be poor estimating. Possibly several bad clients. Overhead has not been controlled. And on and on go the reasons. Once you finally realize how bad the situation is, what can you do? Create a plan, often called a bunker plan, to survive and recover. It’s a plan to get rid of the debt and have positive equity once again. Overhead is the cost of keeping the business functioning even when it has no work. A business’s overhead sometimes grows bit by bit, year by year, until it is too high. When cutting costs here, look at discretionary expenditures: Things you make a choice to buy. Marketing is one such area, particularly when you choose to buy TV or radio time. When trying to reduce costs ,cutting out completely or reducing severely such expenses is key. Because the business owner is too close to the business to realistically question the benefits of such investments, it can be hard for that person to make the needed cuts. Having an outside set of eyes critically examine the overhead expenses and questioning every single item can be a big help on the path to recovery. Costs of Goods Sold (COGS) is the money spent on getting projects done. Labor, materials, and subcontractors are the major components of COGS. When faced with a lot of debt, the business must work hard to reduce COGS while not sacrificing quality. Steps to take include finding less expensive good subcontractors to replace those you have worked with so long that their prices have inched up over time. Getting proposals from several providers for each aspect of the work can be helpful. Working with your in-house work force to help them see how they can be more efficient is another good step. These measures are useful, but they will take some time to have an effect. Estimating must be more accurate. 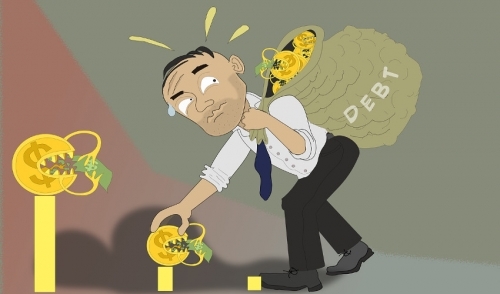 Debt sometimes is generated by incomplete estimates and poor packages handed from sales to production. The resulting slippage in gross profit dollars results in the company selling more jobs to cover the losses on the current jobs. This is a good way to drive a business into insolvency. Doing fewer jobs with realistic, accurate estimates being prepared leads to grippage—earning more money on a project than the company thought it would. These dollars can be used to help pay down the debt. Change orders being written, priced, and sold before any additional work is done is essential to reducing debt. Doing so entails being clear about the original scope of work and teaching your production employees to be able to talk about and sell change orders. Unfortunately, when the cloud of debt is overhead, the company often decides it lacks the time to do this. As a result, the debt grows. It can be impossible to pay all your subcontractors and vendors per the terms that were agreed at the time of purchase. Sometimes a debt-ridden company ignores those obligations. That just increases the stress level of the ownership. It is best to contact each of the subcontractors and vendors. Negotiate realistic minimum payments that will be made. When your company can, it should commit to pay more. By reaching out to these partners and setting realistic expectations, you lift a burden of worry from your shoulders, freeing you to do what needs to be done. When you need more money, a simple way to get it is to do the same amount of work while selling it at a higher price. A percentage point or two or more can drive dollars down to the bottom line. This increase in net profit can then be used to pay down the debt. How to charge more when you are freaked out? Talk with your best past clients about why they keep on having your company do work for them. Write down what you hear. Consolidate your notes. Review them while sitting in your vehicle before going into a sales call. In sales, attitude is everything. Set the debt aside mentally and go in as the best remodeler the prospect will ever meet. The company will continue to receive money, likely just not as much as you would like. Despite that, take 5% of every check and put it into a debt-reduction account. Does 5% seem like too much? Try a smaller amount. The point is to operate on less money while focusing on paying down the debt. It is a simple strategy that will change how the company thinks about the money it receives. For a business, money is a tool. If you abuse it you will be hurt. If you give it the respect it deserves it can make a lot of good things happen. It stinks when you and your company are in a hole. The idea that the business will ever be debt-free can seem preposterous. Control what you can. Reduce overhead, create accurate and more realistic scopes of work, manage your cost of goods sold, negotiate realistic payment terms with your vendors, sell like a champion, and open a debt reduction savings account. When the debt is gone, celebrate. And incorporate all the above changes you made to the way you do business so you will step around the hole in the future.